Celtic Park has become something of a graveyard to Reds` hopes as they have still to record a win at the ground. 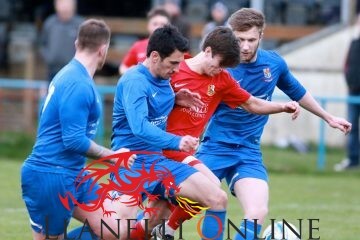 Their latest visit in the second round of the JD Welsh Cup proved to be no more successful, although the manner of the loss was contentious to say the least, and hard to take. With the score locked at 1-1 deep into stoppage time and a further 30 minutes looming, a tackle by Kurtis March on home striker Josh Bull on the byline led to Bull going down far too easily, but referee James Burgess amazed everyone – including the hosts – by awarding a penalty, and to add insult to injury, also red-carded March. Chris Hamm rifled the award past Scott Coughlan to send Celtic into raptures, and within a couple of further minutes the final whistle sealed the Reds` fate. Mr. Burgess had not covered himself in glory throughout, with some dubious decisions, mainly against the visitors, but he could not be blamed for what turned out to be a dire game between two sides who normally attempt to play attractive football, but for some unknown reason decided that route one should be the main attacking ploy this time, leading to a shapeless, mistake-ridden contest with chances at a premium. Having said that, Coughlan was the busier of the two keepers, pulling off a couple of important stops to deny Celtic, although his counterpart, Lewis Watkins, while enjoying a relatively quiet afternoon, was responsible for the Reds` success when he dropped a routine cross at the feet of Jordan Follows. Bull was crowded out in the area when he pursued a clearance, while Lee Bevan did well to deny Hamm at the expense of a corner when Celtic launched an attack down the left. An attempt from distance on the home goal by Liam Samuel sailed just wide, while a similar effort from Lloyd Kinsella suffered the same fate when James Young set him up. Follows and March then combined when the Reds` broke, with the latter sending in a cross which went narrowly over the top . Bevan sent a clearance over the Celtic defence which was met by Follows, but he could not control it well enough to offer a threat on goal and it soared high and wide. 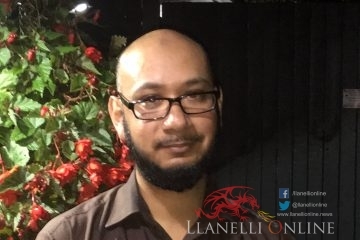 He had better luck, however, on 38 minutes when he opened the scoring, taking advantage of a horrendous error by Watkins who allowed another Bevan delivery to slip from his grasp, and Follows tapped it in from three yards. Stung by this reverse, Celtic countered and Bull sent his finish over the stranded Coughlan but it was just too high. It did not take the home side long to level matters after the restart, and within three minute a flick-on found Kinsella on the right, and he cut into the box before firing past Coughlan at his near post into the top corner. There were appeals for a penalty by Celtic when Bull went down under a March challenge, but this time referee Burgess waved them away. The visitors had barely threatened the home goal, but at last created a chance when Ross Jones sent his namesake, Chris, away on a run down the left, but he shot directly at Watkins who was able to divert away his attempt. At the other end, Coughlan somehow kept out a shot by Bull by diverting if first against the post and then the crossbar, and a short time later pushed over a well struck effort from Iolo Jones which was bound for the net. With the tie now in stoppage time, the defining moment arrived with the game-changing decision by the referee to award the Celtic penalty, and with its conversion, there was no way back for the visitors in the few remaining minutes. 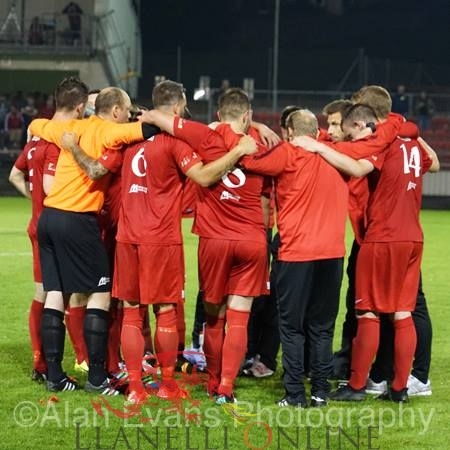 A disappointing end to the Reds` Welsh Cup run, but they will surely find the strength to regroup and concentrate on their league campaign. CWMBRAN CELTIC; Watkins; Patel; Crees; Larcombe; Prangley (Jones, 69); Williams ©; Kinsella; Cook (Wakeham, 90+5); Bull; Young (Maguire (90+6); Hamm; Subs. not used; Dibble; Powell. 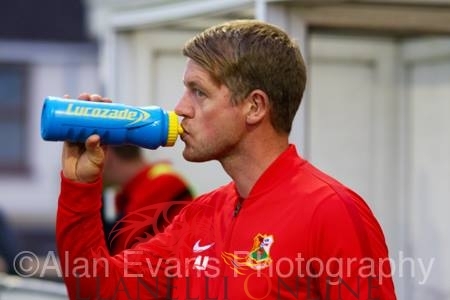 LLANELLI TOWN; Coughlan; Graves; March; R. Thomas (Davies, 83); C. Thomas; Bevan; C. Jones; R. Jones; Clarke ©; Follows (Loveridge, 64); Samuel; Subs. not used; Facciuto; Lewis. 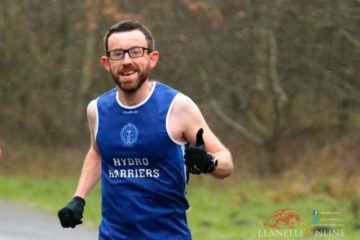 SCORERS; Cwmbran Celtic – Kinsella, 48; Hamm, (P), 90+4. Llane lli Town – Follows, 38. 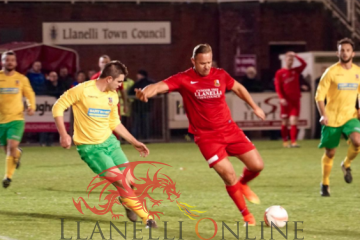 YELLOW CARDS; Llanelli Town – March; R. Jones; Follows; R. Thomas. 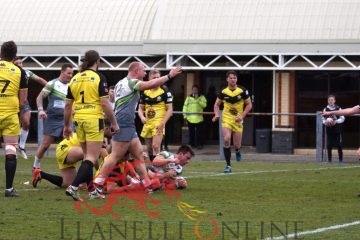 RED CARD; Llanelli Town – March. The Reds resume league action on Saturday when they travel to meet Undy Athletic. Kick off 2 p.m.